We’re very excited to bring to you the first installment of what will be a series of various judging videos! One of our goals is to be able to provide valuable information to help competitive gymnasts and their coaches/parents have a better understanding of the deductions they’re receiving in their routines. Often we have readers tell us they’re confused as to why their gymnast received a low score when her routine looked great. Because gymnastics requires various skills performed to perfection, it is the job of a judge to pick apart routines to ensure they meet specific requirements. 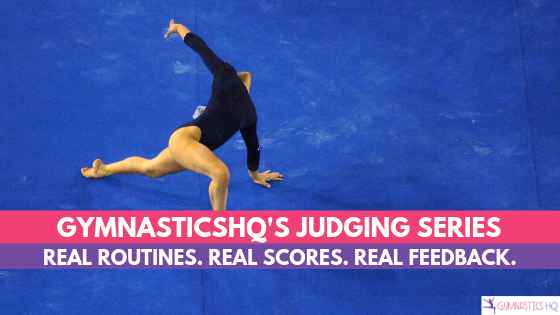 While at first glance it might appear that a routine should receive a higher score, once you get a feel for the complexities behind all the judging deductions, we think you’ll gain a better understanding of your gymnastics score or at least have a better appreciation for all the deductions that might have been taken. To help with this, we’ve broken down four different videos of varying levels and programs in terms of their potential deductions. While you or your gymnast’s level might be different than the gymnasts below, try to use the information in the videos to help you apply it to your own routines. Please note: All four gymnasts have given us permission to use their videos for these purposes. One of the reasons we wanted to showcase Daniela’s Level 6 vault is because at first glance many readers would be shocked to hear she scored an 8.0. In this video we break down the potential sources for her deductions to show you all the variables that go into scoring a vault of this nature and why you might be scoring lower than you think on a similar vault. This bar routine grabbed our attention because it had one very specific deduction that most readers might not realize would lower a score as much as it did. In this video we break down the potential sources for Kyriana’s deductions on her Platinum bar routine and show you why hitting those angles in your requirements is so important to your score. Kaylee’s does a great Xcel Silver beam routine which shows us how little balance checks and form errors can add up. Also, her split leap is a great example of how lack of height can affect score. Kyleigh does a great Level 4 floor routine with relatively few deductions. However, we think this video is valuable in showing you how making some minor form corrections can help even a good score improve. We hope the videos above have given you a better sense of what goes into a score and why at times your score might be lower than expected. Stay tuned for a future installment of GymnasticsHQ’s Judging Series. If you’d like your routine to be in consideration for a feature in our GymnasticsHQ’s Judging Series, you can email your video to anna@gymnasticshq.com. The video of your routine must be a clear view and of good quality. Because of the magnitude of submissions, we cannot respond to your emails but we will watch and consider all videos we receive. If your video has been chosen for a feature spot you will be contacted. By submitting your video you agree to allow GymnasticsHQ to use your video for our Judging Series and to make it public on our blog and social media channels. Thanks for the comment Darcie!! What level is your daughter? I’ve been waiting for someone to breakdown routines… can you do it for all level 8 and 9 ? Hi Matt! Yes, we’re going to definitely add more levels and do more videos in the future. Thank you so much for these. After watching 5 years of competitions, I still question what I think I see and what the judges see. This is so helpful and so clearly explained. Please keep this series going. Thank you for your feedback Kate! We’re glad this was helpful to you. Unfortunately this is not how routines are scored in every state. If my girls did a level 4 routine like that in Wisconsin they would get a low 8. I’m noticing score differences between states and I don’t really understand why some states are taking 1 out of 3 tenths while others are taking all 3 no matter what it seems like. Very frustrating. We’re sorry to hear that Jaclyn. These routines were taken from all different states so there is a nice mix of scores from all over the country. We can understand how frustrating that must be. Hang in there and hopefully the stricter scoring will help your girls become more aware of their form and give them a better foundation moving forward. Great information, this will really help our level 3 gymnast understand that it really is ALL about straight, tight arms and legs and keeping those toes pointed. Yes! Straight arms and legs and pointed toes!! For the platinum bar routine she does not have to have the clear hip to horizontal to meet requirement as long as her cast is above horizontal. She needs either a cast or a clear hip to finish above horizontal. So, she will have a 9.5 start value if she doesn’t meet one of those requirements. It does not need to be both to meet requirement. Unfortunately in this routine she did not meet either. Platinum is tough though! Great start. Keep working hard and she will improve. Yes that is correct but when she didn’t have either we just said it there that she was missing the requirement. Thank you so much for this!! My daughter loves it. These are great video’s. Thank you for this! This is very helpful for parents who don’t know anything about gymnastics! Hi Patricia, Thanks for your comment. We’re glad this was helpful! Wow, this was awesome! I’ve never understood judging and maybe because I have never had anyone explain it step by step like this. I’m definitely showing cc this! So so helpful. Definitely would love to see more of these videos explaining judging! LOVE THIS!! Thank you! This is very helpful and would definitely appreciate more! This is amazing. Thank you so much for taking the time to put this together. There are always so many questions after meets that never get answered. It makes it very hard to make corrections to routines. It is so hard too when the coach would like to ask the judge about the deductions and they won’t say a word. Please continue to make more videos, it is a perfect learning opportunity for our gymnast! Thank you so much for this post! It is so helpful and informative! We just love you site! You do an amazing job! Thank you! Thank you! Very valuable information. I was most interested in the Platinum bar routine as that was at our NC Stare Meet and we will be competing Platinum in the upcoming season. Please keep the videos coming!!!! is there anyway you can judge my vault? i have states in two weeks and my coach can’t find anything wrong with my vault and i want to get the highest score possible! Thank you for the info, it is very informative. Half the time I see a routine that I thought was executed beautifully, get a low score, and others get a higher score. At least now I understand a little more. You are more than welcome to use my daughters as well. She is USAG silver, this year she will be gold. W live n California.